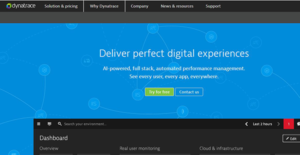 Dynatrace is an all-inclusive application monitoring software for DevOps in enterprises and SMBs. The platform leverages proprietary artificial intelligence (AI) technology to provide actionable insights that enable businesses of all sizes to effectively control thousands of servers from a unified interface. It supports automated performance management and allows businesses to visualize every user and application, everywhere. The program enables DevOps to discover application dependencies and provides an automatic root cause analysis of every performance issue. Its open ecosystem means it is available as On-premises, managed, or SaaS and can seamlessly integrate into the IT landscape with open APIs. Some of its key capabilities include business & performance analytics; digital experience management; application monitoring management; performance lifecycle management; and container, cloud, and infrastructure monitoring. Dynatrace is an all-in-one performance monitoring solution designed to serve businesses of all sizes. The software supports full-stack monitoring to enable businesses to detect and diagnose both performance and availability issues. It’s a unified solution that enables SMBs and enterprise to analyze application performance across the entire applications stack down to distinct transactions, across all technologies and layers. With full stack monitoring, businesses get in-depth insights into application performance, customer experience, and infrastructure monitoring. The platform facilitates automated monitoring at scale with capabilities to support even the largest environment with over 100000 hosts. It features automatically adjusted and pre-configured dashboards with no manual configurations for all installations. In addition, Dynatrace’s artificial intelligence persistently learns application behaviors, auto-detects end-to-end dependencies & anomalies, and proactively spots the root cause of all issues. It discovers the entire application stack right from the end user’s web browser to the applications, down to the cloud, container, and infrastructure. Another benefit of Dynatrace is its big data analytics. The application optimizes artificial intelligence to deliver answers with actionable acumens to your operation staffs, business stakeholders, and development teams. It links business outcomes to the performance insights to enable business owners to fully comprehend the repercussions of detected issues. This makes it easy to resolve all the problems before they affect your customers. Additionally, Dynatrace learns all baseline performance of user applications and sends notifications when new code deployment precipitates high resource consumption. If you are interested in Dynatrace it may also be sensible to check out other subcategories of Best Application Performance Monitoring Software listed in our base of B2B software reviews. Every company has different wants and needs an application that can be personalized for their size, kind of staff members and buyers, and the specific industry they are in. For these reasons, no system can proffer perfect features off-the-shelf. When you try to find a software product, first be sure what you require it for. Read some Dynatrace reviews and ask yourself do you need basic tools or do you need sophisticated functionality? Are there any industry-specific functionalities that you are looking for? Obtain the answers to these queries to aid your search. There are multiple factors that you need to reflect on and these include your finances, particular business wants, your organization size, integration needs etc. Take your time, use a few free trials, and finally zero in on the platform that offers all that you need to boost your organization efficiency and productivity. How Much Does Dynatrace Cost? Dynatrace offer a consumption based, enterprise pricing model with three plans namely self-service, enterprise, and webscale. Contact the vendor for more details on their pricing. We realize that when you make a decision to buy Application Performance Monitoring Software it’s important not only to see how experts evaluate it in their reviews, but also to find out if the real people and companies that buy it are actually satisfied with the product. That’s why we’ve created our behavior-based Customer Satisfaction Algorithm™ that gathers customer reviews, comments and Dynatrace reviews across a wide range of social media sites. The data is then presented in an easy to digest form showing how many people had positive and negative experience with Dynatrace. With that information at hand you should be equipped to make an informed buying decision that you won’t regret. What are Dynatrace pricing details? What integrations are available for Dynatrace?